Philadelphia Flyers center Jim Dowd is the only New Jersey native to garner the trifecta of hockey excellence -- a state high school title at Brick (N.J.) High, a collegiate national championship with Lake Superior State and a Stanley Cup with the New Jersey Devils. "It's not something I dwell on often, but it's cool; it's pretty neat, actually," Dowd told NHL.com. "Not too many players can claim they won championships on those three levels, but I've always played to win. I still remember what my father told me when I was about to leave for college in 1987. He told me to not worry about the other guys and just do what I do." That's precisely what the 39-year-old veteran has done. Make no mistake -- Dowd is as competitive as any top-line center in the game today. The only problem is he has to work twice as hard to earn a roster spot as a fourth-line player at this stage in his career. "That's fine," Dowd admitted. "I really don't pay attention to what other people think. I realize there are fantastic young players in the game today and that's a good thing. I'm just playing the game." 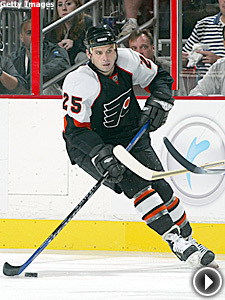 In addition to being the fifth-oldest active player in the NHL and the fifth-oldest ever to wear a Flyers jersey, Dowd has played for 10 NHL teams, four American Hockey League clubs and one International Hockey League franchise. He also spent a year playing in Germany during the 2004-05 work stoppage. "It gets tougher on my family as my sons grow older, but having the opportunity to play with the Devils (in 2006-07) and now the Flyers has provided me with a great situation since I'm close to home," Dowd said. "We've met tons of great people throughout my 16 years in the League and I wouldn't trade any of them for anything. Hey, everywhere we go we know somebody, so we have a connection in almost every region of the country and in Germany." Dowd also hasn't forgotten his hometown, Brick Township, which is located in the New Jersey shore area. For the last 10 years, Dowd's Shoot for the Stars Foundation has helped raise money for local families and organizations in the area. The big event is an all-star hockey game; proceeds from last year's game, which featured players from the Jersey shore, benefited Big Brothers Big Sisters of Ocean County, N.J. His efforts have helped raise more than $100,000 since the inaugural charity hockey game in 1998. "The game really took off after that first one and it's great because it's a way for me to not only help out, but stay in touch, especially during my time out on the West Coast," Dowd said. "A lot of people helped me along the way in putting this game together, and for that, I'm forever grateful." For his dedication on and off the ice, Dowd is the Flyers' nominee for this season's Masterton Trophy, awarded to the player who best exemplifies the qualities of perseverance, sportsmanship and dedication to hockey. The members of the Professional Hockey Writers' Association that cover each team choose that club's nominee. "Any time you're up for an NHL award, it's a great feeling," Dowd said. "I'm glad to still be involved in the game and to be recognized." Flyers defenseman Jaroslav Modry, who was nominated for the Masterton by the Los Angeles Kings' writers, says Dowd is a perfect candidate. "He has that love for the game that you can sense in his body language," Modry said. "He has a sense of urgency each shift, and just by the way he carries himself and talks to everyone in the locker room, you can tell he's dedicated. It's great to call him my teammate." Dowd, drafted by the Devils in the eighth round of the 1987 Entry Draft, has played for New Jersey, Vancouver, the New York Islanders, Calgary, Edmonton, Minnesota, Montreal, Chicago, Colorado and Philadelphia. The biggest goal of his career came in Game 2 of the 1995 Stanley Cup Final, when he scored the game-winner for the Devils in a 4-2 victory over the Detroit Red Wings. For Dowd, the goal was "like scoring a touchdown in the Super Bowl or hitting a home run in the World Series." The Devils went on to sweep the Red Wings en route to their first Stanley Cup. In addition to winning a Cup with the Devils, Dowd also recalls being a part of the 2000 expansion, when Minnesota and Columbus joined the League. Minnesota made Dowd their 15th choice (30th overall) during the 52-player expansion draft. "I knew going in that (Doug) Risebrough was general manager, and once they hired (Jacques) Lemaire, I said to myself, 'This team is going to go places,' " Dowd said. "The kids they drafted were all good two-way players. If people can't see that Lemaire is the best coach in the League, then something's wrong. Within three years, he had an expansion team going to the conference final (2002-03)." Dowd spent almost four seasons with Minnesota, from 2000-04, collecting 32 goals and 89 assists in 283 games. Whenever he decides to hang up the blades, he feels he would make a good coach. "I know I could coach in some capacity in this League," he said. "Whenever I'm done, whether it's after this season or five seasons from now, I'm not going to rush into anything because I realize coaching is a big commitment as well, and takes up even more time. I want to spend time with my kids because they're at a great age right now."